(Nanowerk News) Broken bones may be repaired more effectively by using a biodegradable coating for magnesium-based metal implants. 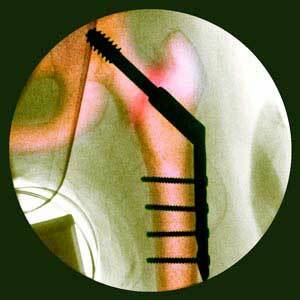 Some bone breaks require a temporary metal implant for support while they heal. “However current implants, such as screws and braces made of titanium, steel or cobalt-chromium alloys, have serious drawbacks,” explains Sandor Nemeth of the A*STAR team involved in developing the innovative coating. Firstly, the difference in mechanical properties between the metals and the healing bone can loosen the implants and damage the bone. In addition, the temporary implants must eventually be surgically removed, resulting in further risk and inconvenience. The A*STAR team is developing a biodegradable implant that is a better mechanical match with bone, and might also can directly contribute to the healing process (Journal of Biomedical Materials Research B: Applied Biomaterials, "Novel biodegradable calcium phosphate/polymer composite coating with adjustable mechanical properties formed by hydrothermal process for corrosion protection of magnesium substrate"). Magnesium is a strong and flexible metal, but its reactivity means it cannot be used alone because it would corrode too quickly inside the body. The tendency to corrode, however, could become an advantage as the rate of degradation could be controlled. The trick is to find a coating that degrades slowly enough to support the bones during healing, then safely disperses when the job is done. Nemeth and his PhD student, Sara Kaabi, at the A*STAR Singapore Institute of Manufacturing Technology, collaborated with Ming Jen Tan of Nanyang Technological University to explore potential coatings. “We turned to calcium phosphate because in nature this inorganic material is a key component of bone and other strong materials such as sea shells,” says Nemeth. Incorporating carbon-based organic polymers produced a composite coating with several key advantages: varying the mix of components allows the mechanical and biodegradable properties to be adjusted for different requirements and avoids the brittleness of purely inorganic coatings. Studies with cultured cells suggest the calcium phosphate might also actively assist the healing process by providing some raw materials to sustain bone growth. The magnesium is coated from a solution of pressurized hot water in a one-step process, offering a simplicity that may be crucial for commercial-scale production. “Animal trials are an obvious next step, but would require an industry partner,” says Nemeth. The researchers are also exploring options to make the coating even more useful by incorporating antibiotics and other drugs that could permeate the surrounding tissues and bone and contribute to healing.